Sathya Sai Baba (November 23, 1926 – April 24, 2011) was a Hindu Guru with a mass following of devotees in India and around the world. 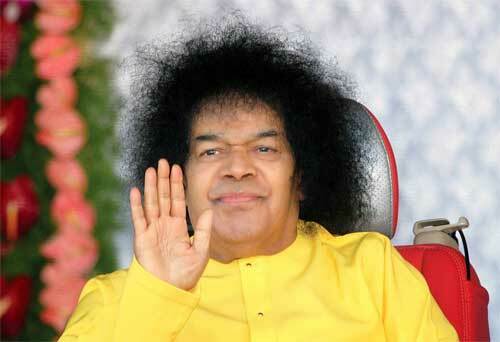 Sathya Sai Baba quotes are mainly from newspapers, videos, books and magazines. The 108 quotes have been collected over a period of 10 years. It is because the doctrine of human unity based on the spiritual oneness of all beings is not propagated in the right manner that we have today many divisions leading to many conflicts. Religions are many, but goal is one. Jewels are many, but gold is one. Stars are many, but sky is one. Cows are many, but milk is one. Beings are many, but breath is one. Nations are many, but earth is one. Flowers are many, but worship is one. Conclusion – Behind the diverse names and forms, there is the universal life. For everything there is reaction, resound and reflection in this Kali Age. When you speak softly and sweetly to others, you will receive the same in return. If you are rude to others, others will also be rude towards you. Every individual, irrespective of his age and country, must therefore speak softly and sweetly. Whether one is educated or illiterate, one must have humility. All that you experience in this world is nothing but the reflection, reaction and resound of your own feelings. So, you should be good to everybody and work with the spirit of unity and love. When the senses are allowed to have their way, all kinds of reactions occur. It is only when the sense are brought under unified control that the nature of Divinity can be comprehended. Happiness is essential for God-realization. It is one of the big gateways to Divinity. If man is unhappy, this is not just a flaw. This is one of the most serious flaws! This is an obstacle on the way to self-realization! In most cases people are unhappy because of worldly aspirations, attachments, and joys: they pay too much attention to the worldly. In order to help one get rid of this flaw, it is necessary to point out how much serious this flaw is. One should realize that desires are never-ending like waves in the sea. In many cases, the reason for people’s suffering is that only through suffering God can convince them of the necessity of turning inside, into the depth of the multidimensional structure of their organisms, of the necessity of self examination. Without this, such people will never get rid of suffering! God is inside, in the depth! He heals from there. Those who seek bliss in the Atman should not run after the joys of sense objects. Just as a body which has no breath is useless and begins to rot and stink, similarly life without the Truth is useless and becomes the stinking abode of strife and grief. Believe that there is nothing greater than the Truth, nothing more precious, nothing sweeter, and nothing more lasting. First give up the evil tendency to feel envious at the prosperity of others and the desire to harm them. Be happy that others are happy! Sympathize with those who are in adversity and wish for their prosperity. That is the means of cultivating love for God. When the mind is motionless and silent, one can hear the voice of God. Anyone who is able to purify the mind from anxiety, agitations, and thoughts can attune themselves to the voice of God inside. The main enemies of man, leading to accumulation of negative karma, are the wrongly directed mind and the uncontrollable emotional sphere with dominating egotistic or coarse emotions. Man can overcome the obstacles of ego and anger by strengthening faith, by directing the mind toward Divinity, and by using spiritual practices, which, first of all, normalize the emotional sphere and help to learn how to control the mind and consciousness. The most important spiritual practice is the search of one’s own imperfections and weaknesses, and making attempts on ridding oneself of them, becoming closer to the Perfection. Like a bird that sees a lump of flesh in the far distance, but does not notice the net spread over it to catch it, man too sees but the charms of material objects; he does not notice the entanglements which they cause. Man tries to map the craters and canyons and the volcanoes on the moon, but ignores the craters within his own heart; how then can he acquire peace? Man undergoes enormous trouble to guard his wealth but does not spend an iota of energy to guard his inner consciousness. Some people say that they are too weak to scale spiritual heights. But you have the strength to commit sins and do wrong actions. The strength required for good or bad actions is the same. In fact, it is more difficult to commit sin than to be good and meritorious. Concentrate on developing the firm conviction that you are the Divine. With this conviction you can achieve anything. Give up the attachment to the body. Even scientists sometimes forget their body consciousness while absorbed in their experiments. If that is the case, why should the spiritually minded persons retain attachment to the body, which is made up of the five elements and is a container of all foul things. Unless you give up, you cannot acquire – that is the rule of life. Even trivial things cannot be won without parting with something. One has to pay to secure the most precious of all gifts, the gift of the awareness of the Atma! To earn this, one has to give up sensual pleasures, but is this too big a price. In fact, what is renounced is not pleasure at all. It is fraught with pain too. Any man, irrespective of age or abilities, who has faith and determination, can accomplish what he wants. Try to know the truth. But do not waste your time in trying to understand some abstract concepts which you are unable to comprehend. Develop firm faith that God exists. Most ailments can be treated by medicines. But most ailments in the world today have their origin in the mind. The aberrations of the mind set up reactions in the body and cause various diseases. The main cause of many human ailments is rooted in the mind. Never forget God. Do not believe in the world, which is perpetually changing. Don’t fear death. If you learn to observe these three maxims, you can accomplish anything. Be Silent yourself, that will induce Silence in others. Dedication ensures success; purifies inner vision and gives lasting joy. For everything, there is reaction, resound and reflection in this Kali Age. When you speak softly and sweetly to others, you will receive the same in return. If you are rude to others, you will receive the same in return. If you are rude to others, others will also be rude towards you. Every individual irrespective of his age and country must therefore speak softly and sweetly. Whether one is educated or illiterate, one must have humility. All that you experience in this world is nothing but the reflection, reaction and resound of your own feelings. So, you should be good to every body and work with the spirit of unity and love. When the senses are allowed to have their way all kinds of reactions occur. It is only when the senses are brought under unified control that the nature of divinity can be. So long as one goes on multiplying his desire, he will continue to be in want. When man controls his desires, man attains prosperity. Greed makes a man unhappy and miserable. Only when greed and miserliness are given up can one have an enjoyable and peaceful life. Greed yields only sorrow; contentment is best. There is no happiness greater than contentment. Man is deluded by the trivial pleasures from mundane things and is filled with greed and lust. This is the main obstacle in the spiritual path. Greed is the monstrous evil that drags man down. You can hoodwink anyone, but not God. He is always watching you. He is the eternal witness. He is present in you, just as the power of vision resides in your eye. Not even a blade of grass can move without His Will. God asks for neither hope nor despair. They are subject to relativity. Universal Being is beyond both hope and despair, both certainty and doubt. It knows no lingering in conclusions. It is every flowing, in all directions, and in none of them. Do not get work done through cooks, servants, ayahs and others. You must not depend on others to do your work. Earning time for meditation through these servants is not a spiritual gain. Do all the household work as acts of worship for Him; that is more fruitful than hours of meditation, hours gained by entrusting this precious work to paid helpers. Evil qualities and unrighteous conduct of man are responsible for the injustice, untruth, unrighteousness that prevail in the world today. You have to develop virtues and follow the righteous path if you want to enjoy peace and happiness. The pains and sorrows that come during one’s daily life must be forgotten and you must leave them behind. Only when you make an attempt to lead such a life will it become fruitful. The senses are the villains. They instill the delusion that you are the body. The human body is a prey to many ailments. Man regards all of them as bodily ailments. But not all of them are entirely related to the body. Purely bodily ailments can be treated by medicines. But most ailments in the world today have their origin in the mind. The aberrations of the mind set up reactions in the body and cause various diseases. The main cause of many human ailments is rooted in the mind. Try to know the truth. But do not waste your time in trying to understand some abstract concepts which you are unable to comprehend. Develop firm faith that God exists. Also have the faith that you are God. You cannot understand anything without developing faith. First and foremost, develop faith in the concept of “I.” Only then you can understand what is meant by ‘you.’ Without knowing “I”, how can you know ‘you’? People think that they enjoy sense objects. But in fact, objects enjoy them. Indulging in pleasures of the senses turns people into weaklings. Worldly enjoyments are not permanent. You may have worldly enjoyments but you should always have God as your aim and goal of life. Lead your life with divine thoughts. When you live like that, you achieve victory in all of life’s endeavors. Man has been enslaved by money. He lives a superficial, hollow and artificial life. This is indeed a real pity. Man should seek to possess only as much as is most essential for his living. The quantity of riches one must own can be compared to the shoes one wears: if too small, they cause pain; if too big, they are hindrance while walking. Money, too, has to be with us only just enough for a life of physical and mental comfort. When we have more, it breeds pride, sloth and contempt for others. In pursuit of money, man descends to the lowest level of consciousness. Money is of the nature of manure. Piled up in one place, it pollutes the air. Spread it wide, scatter it over fields, and it rewards you with a bumper harvest. So, too, when money is spent in all the four quarters for promoting good works, it yields contentment and happiness in plenty. Realize that the Atma is your life. Everyone of you is endowed with divine energy. But you are misusing it. Your youth is in your hands. Your life-force is in your hands. You are not the body; you are the life force. Body is meant to serve as an instrument in your quest for truth. The same atma is present in all. Here you see a silver tumbler. There is water in it. The tumbler is the basis of water, and silver is the basis of tumbler. But divinity is the basis for everything. Divinity does not comprise of any material. Similarly the Atma is not composed of any material. If you look at the Atma as material, it will appear to you as material. Hence, change your vision. Do not limit yourself to materials only. The non-dual principle of Atma Tattwa immanent in the body is eternal and transcendental. It is omnipresent. It has no name or form. How can one give a name to such an all-pervading Atma Tattwa? It is only a futile exercise. Develop firm faith in the omnipresent Atma Tattwa. That faith is awareness…First and foremost, turn your vision inward and contemplate on the Atma Tattwa present in you. This Atma Tattwa can be realized only by constant Sadhana. It is only after realizing this Atma Tattwa can one deliberate on it.